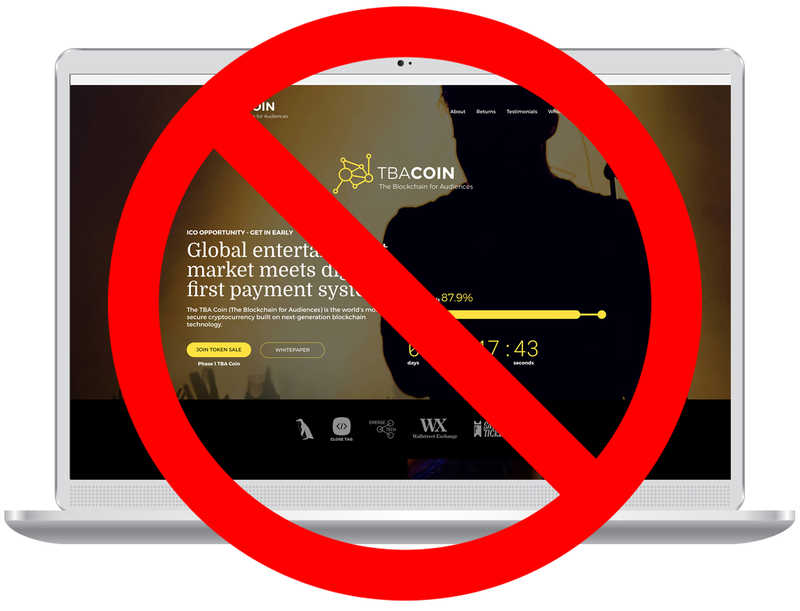 TBACoin is not real. 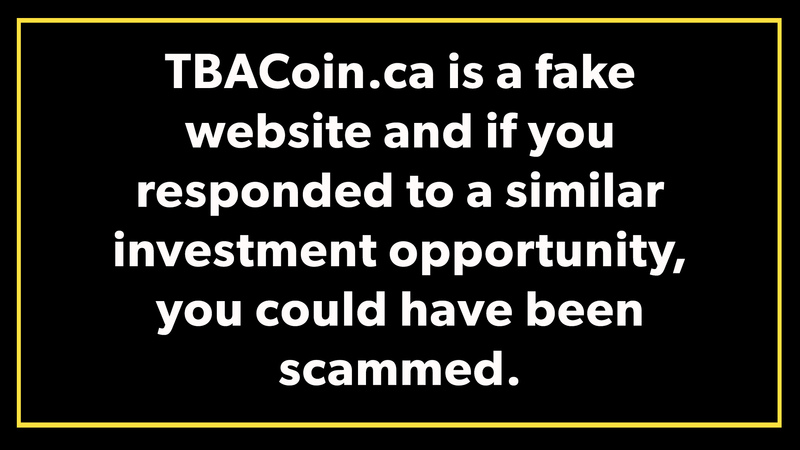 TBACoin.ca was created to raise awareness about fraudsters pretending to be involved in cryptoassets and blockchain technology. Initial coin offerings (ICOs) (often referred to as initial token offerings (ITOs) or token generation events) are an innovative means for businesses to raise capital. Over the past several months, many Ontarians have been approached about or participated in an ICO. Unfortunately, many fraudsters have tried to take advantage of this trend by branding old-style investmentInvestment An item of value you buy to get income or to grow in value.+ read full definition scams as fake ICOs. These fraudsters typically set up flashy websites and try to generate hype through ads, social media and other channels. You can better protect yourself and distinguish a legitimate ICO from a fake offering by knowing how to recognize the red flags of fraud. In general, higher-risk investments offer higher potential returns, and lower-risk investments offer lower returns. This is known as the risk-return relationship. When you buy investments like stocks, there’s no guarantee you’ll make money. And the risk of losing money increases with the potential return. Investments that are considered low risk typically have returns similar to GIC rates. If your expected returnExpected return Estimated value of your investment in the future. Tells you the overall profit you might expect – either as income (interest or dividends), or as capital gains (or losses). Often expressed as a percentage.+ read full definition is higher than this, you’re taking more risk with your money. Learn more about the risks of investing. The sources of “hot tips” or “insiderInsider Every director/senior officer of a reporting issuer; every director/senior officer of a company that is an insider or subsidiary of a reporting issuer; any person/company who owns or controls more than 10% of the voting securities of a reporting issuer.+ read full definition information” don’t have your best interests in mind. Think about why they’re offering you tips, and how they benefitBenefit Money, goods, or services that you get from your workplace or from a government program such as the Canada Pension Plan.+ read full definition by telling you about them. If the hot tipTip The sharing of important information about a company not known to the public.+ read full definition is false, you will lose your money if you act on it. If it is really inside information about a public company, it would be illegal to act on it under insider trading laws. Scammers frequently use high-pressure sales tactics – because they want to get your money and then move on to other victims. If you’re asked to make a decision right away, or are presented with a limited time offer, it’s likely not in your best interests. Scammers know that if you have time to check things out, you may not fall for their scamScam When someone tries to make money by misleading or tricking another person.+ read full definition. Before you investInvest To use money for the purpose of making more money by making an investment. Often involves risk.+ read full definition, check the registrationRegistration A requirement for any person or company trading investments or providing advice in Canada. Securities industry professionals are required to register with the securities regulator in each province or territory where they do business.+ read full definition and background of the person offering you the investment. In general, anyone selling securities or offering investment advice must be registered with their provincial securities regulatorSecurities regulator A government agency that enforces the securities act in jurisdiction it has authority over. This act is made up of laws that establish rules for issuing and trading securities. The Ontario Securities Commission is the securities regulator for Ontario.+ read full definition. Check registration through the Canadian Securities Administrators’ (CSA) National Registration Search. Check their background to find out if they have been in trouble with a securities regulator using the CSA’s Disciplined Persons List. The Ontario Securities CommissionOntario Securities Commission An independent Crown corporation that is responsible for regulating the capital markets in Ontario. Its mandate is to provide protection to investors from unfair, improper or fraudulent practices, to foster fair and efficient capital markets and confidence in capital markets, and to contribute to the stability of the financial system and the reduction of systemic…+ read full definition (OSCOSC See Ontario Securities Commission.+ read full definition) recognizes blockchain’s potential to foster innovative ways of raising capital and increase transparencies and efficiencies in the capital market. The OSC is working to encourage innovation through OSC LaunchPad, which engages with fintech companies to help them navigate legal requirements and strives to keep regulation in step with digital innovation. The OSC has also prepared a number of resources to help investors learn more about cryptoassets. You’ll find a number of resources on GetSmarterAboutMoney.ca, the OSC’s investor education website, which provides unbiased information about investing and tools to help you make informed investment decisions. Learn more about how cryptoassets work, the key features of different cryptoasset products, and how to distinguish a legitimate cryptoasset offering from a fraud.